Some 6,000 Seattle school teachers held a one-day strike on May 19, defying the Washington State Legislature. Along with student allies, they marched to demand adequate school funding. 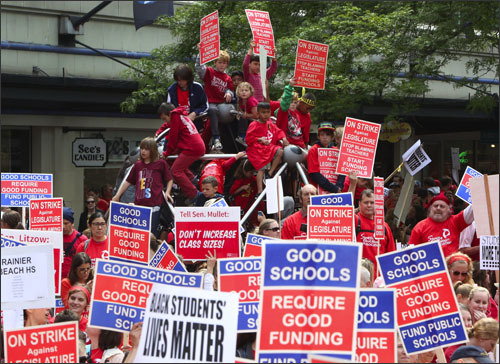 After a noon rally, the Seattle Education Association was joined by teachers from Issaquah and Mercer Island as they marched from Seattle Center to downtown and back again. The action was part of statewide “rolling walkouts.” Washington Education Association President Kim Mead said over half of its 85,000 members had walked out so far in April and May, with more scheduled. Across the country, teachers’ unions and parents are fighting for funding for education as state politicians impose budget cuts while slashing taxes for the rich. With the impoverishment of students, families and communities, public schools are now seen as society’s basic safety net. Several years ago the WEA and other public education supporters brought a lawsuit that forced the state Supreme Court to mandate increased funding for K-12 public education. 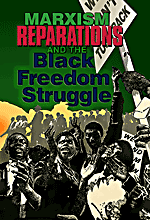 This included resources for students and compensation for teachers. But the Supreme Court has yet to issue any penalty. So the teachers and their allies are now ratcheting up the pressure. In addition, an initiative the teachers got on the ballot mandating lower class sizes was approved by the voters. But the state Legislature hasn’t done anything to lower the very high class sizes either. The Seattle walkout began at 8 a.m. with picketing at many schools and marching past other schools. Dozens of strikers carried “Black Students’ Lives Matter” signs. Jesse Hagopian, a teacher at Garfield High School, told KIRO-TV: “It’s simply outrageous that the state Legislature has given itself an 11 percent pay raise while offering a measly 1.8 percent for teachers.” The teachers’ pay ranks 42nd in the country. School paraprofessionals protested having to live on public assistance and being homeless. On May 22, 1,000 teachers and students marched in Kennewick in eastern Washington when teachers struck there. Spokane teachers in the state’s second-largest district have voted to strike on May 27. Teachers’ unions in 64 districts have voted to walk out.